Director Joe Wright’s film Darkest Hour is a historical saga. A war film that showcases the back-room drama behind the battlefield — the evacuation of British soldiers from Dunkirk during World War II. The film gives a totally different perspective to Christopher Nolan’s recently released Dunkirk. This is a character-driven film which is set during the early days of Winston Churchill’s appointment as the Prime Minister of the UK. This verbose yet stunningly cinematic history lesson balances the great orator’s public triumphs with more vulnerable private moments of self-doubt. It also elevates the inner workings of the British government into an enthralling piece of mainstream entertainment. The narrative begins on May 9, 1940 and takes you through the days to Operation Dynamo. France and Belgium are on the brink of surrendering to Hitler. The UK Parliament has lost confidence in Prime Minister Neville Chamberlain who has terminal cancer and tenders his resignation directly to King George. Churchill wasn’t anyone’s first choice, but was selected only because he was the only conservative of whom the opposition approved, in part because he had switched parties over the previous decade. The film focusses solely on the Prime Minister except for a couple of initial scenes, during which he is dramatically absent, but is represented only by his hat which is left behind on his empty seat in the House of Commons. While Churchill was a man of conviction, the film paints him as the lone politician who was willing to defy Hitler and declare war, “at any cost” if necessary, when many wanted to seek peace. The film thus frequently shows us the finer nuances of his character from the viewpoints of his acerbic though supportive wife, Clementine and his newly appointed young secretary Elizabeth. The brilliance of this film’s portrayal begins with the dramatic sharpness and historical intelligence of Anthony McCarten’s script, which gives us a Churchill who is drawn into dynamic action by the looming shadow of Hitler’s evil. The director makes him memorable with an impactful introduction. Seated in the dark of his own bedroom, illuminated only by the match he strikes to light his signature cigar, you get a glimpse of the man – Winston Churchhill. The face that appears belongs to Gary Oldman, which is totally unrecognizable beneath Kazuhiro Tsuji’s brilliant prosthetic make-up. Oldman’s performance as Churchill is extraordinarily brilliant. Initially, he appears to be a crabby old politician who is constantly holding a drink but then his transformation to an alert, intense and aggressively intelligent and shrewd politician is striking. 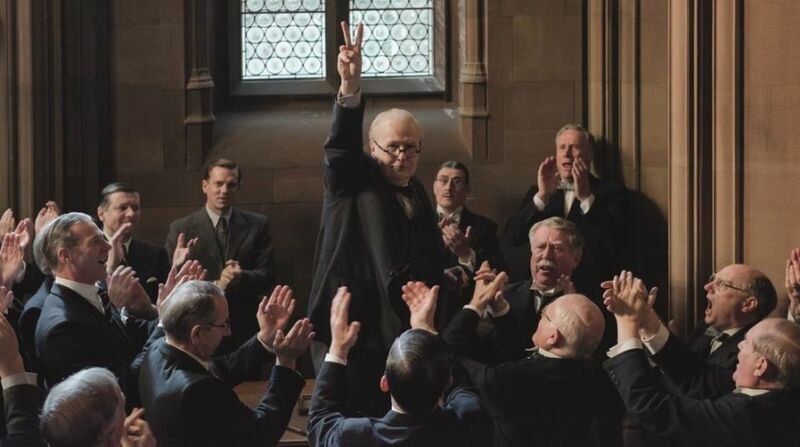 Though Oldman portrays Churchill in his own distinct style, it is the politician’s strong character that gives him the stimulus to shine. Oldman is aptly supported by the rest of the cast, who are in one-dimensional but well-chiselled parts. The ones who shine are Ronald Pickup as the resigned Neivelle Chamberlain, Kritin Scott Thomas as his wife Clementine, Lily James as his secretary Elizabeth, Stephen Dillane as Viscount Halifax, Ben Mendelsohn as King George VI. Apart from the performances, it is the production values that are the highlights of the film. The drama takes place in an entirely different sphere, its locations ranging from the bunker-like cabinet war rooms beneath Westminster Palace to Churchill’s own private residence, which is impressively recreated by Production Designer Sarah Greenwood. The characters were appropriately dressed in costume designer Jacqueline Durran’s outfits. And the era was perfectly captured by cinematographer Bruno Delbonnel’s lens. The few striking images in the film are the zoom-out shots that extend to the aerial view of the war-zone. Dario Marianelli’s score is routine, yet effective in parts, It complements the visuals appropriately. Overall, Darkest Hour is a talk-heavy film with an equally engaging performance by Gary Oldman.